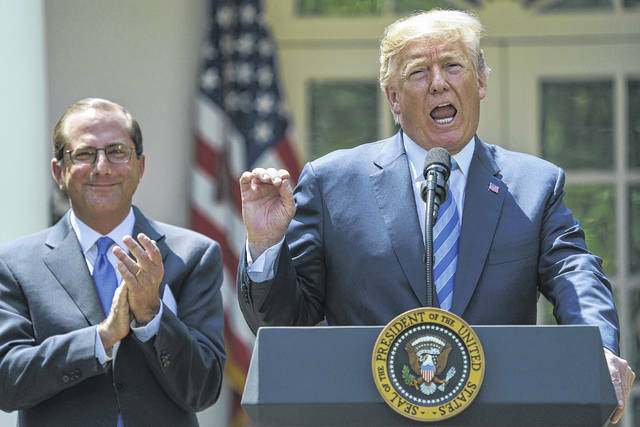 President Donald Trump speaks during an event about prescription drug prices with Health and Human Services Secretary Alex Azar, left, in the Rose Garden of the White House in Washington, Friday, May 11, 2018. WASHINGTON (AP) — President Donald Trump’s long-promised plan to bring down drug prices, unveiled Friday, would mostly spare the pharmaceutical industry he previously accused of “getting away with murder.” Instead he focuses on private competition and more openness to reduce America’s prescription pain. The administration will pursue a raft of old and new measures intended to improve competition and transparency in the notoriously complex drug pricing system. But most of the measures could take months or years to implement, and none would stop drugmakers from setting sky-high initial prices. Drugmakers generally can charge as much as the market will bear because the U.S. government doesn’t regulate medicine prices, unlike most other developed countries. — A potential requirement for drugmakers to disclose the cost of their medicines in television advertisements. — Banning a pharmacist “gag rule,” which prevents druggists from telling customers when they can save money by paying cash instead of using their insurance. — Speeding up the approval process for over-the-counter medications so people can buy more drugs without prescriptions. — Reconsidering how Medicare pays for some high-priced drugs administered at doctors’ offices. Those ideas avoid a direct confrontation with the powerful pharmaceutical lobby, but they may also underwhelm Americans seeking relief from escalating prescription costs. Democrats pounced on Trump for not pursuing direct Medicare negotiations, an idea he championed before reaching the White House. “This weak plan abandons the millions of hard-working families struggling with the crisis of surging drug prices,” said Democratic Leader Nancy Pelosi, in a statement. Pharmaceutical investors and analysts expressed relief after the announcement, and shares of most top drugmakers rose Friday afternoon, including Pfizer, Johnson & Johnson and Eli Lilly. Some parts of the plan were previously proposed in the president’s budget proposal sent to Congress, including providing free generic drugs to low-income seniors and sharing rebates from drugmakers with Medicare patients. Other parts could be implemented directly by the administration. A majority of Americans say passing laws to bring down prescription drug prices should be a top priority for Trump and Congress, according to recent polling by the Kaiser Family Foundation. As a candidate, Trump railed against the pharmaceutical industry. But as president he has shied away from major changes and has staffed his administration with appointees who have deep ties to the industry. They include Health Secretary Alex Azar, a former top executive at Eli Lilly and Co., who joined Trump for Friday’s announcement. Azar and other Trump officials have hinted for weeks that the plan would, in part, “dismantle” the convoluted system of rebates between drugmakers and the health care middlemen known as pharmacy benefit managers, which negotiate price concessions for insurers, employers and other large customers. Trump called out those companies in his speech: “Our plan will end the dishonest double-dealing that allows the middleman to pocket rebates and discounts that should be passed onto consumers and patients,” Trump said. Azar later told reporters that the administration would “seek input” on doing away with drug rebates in the Medicare system to encourage more direct discounts. He gave no timeframe for more concrete steps. America has the highest drug prices in the world. Trump’s speech singled out foreign governments that “extort unreasonably low prices from U.S. drugmakers” using price controls and said U.S. trade representatives would prioritize the issue in trade deals. But experts are skeptical the U.S. can pressure foreign governments to pay more for drugs. “It’s hard to know why Germany or France or Australia would agree to something like that,” said Professor Jack Hoadley of Georgetown University’s Health Policy Institute. In the U.S., Medicare is the largest purchaser of prescription drugs, covering 60 million seniors and Americans with disabilities, but it is barred by law from directly negotiating lower prices with drugmakers. The drug industry’s top lobbying arm, Pharmaceutical Research and Manufacturers of America, spent nearly $26 million to sway federal decision makers last year, according to records tallied by Center for Responsive Politics. The annual total was a record for the group. Associated Press writers Ken Thomas, Catherine Lucey, Tom Murphy and Linda A. Johnson contributed to this report.